Need a Thanksgiving Dish? 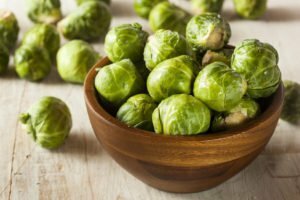 Try Roasted Brussel Sprouts! If you are still looking for a side dish to compliment a traditional Thanksgiving dinner, we got you covered! While these sprouts are the lesser-liked of the all the vegetables, this simple recipe turns Brussels into a delicious dish! This makes a perfect side dish to take to a Thanksgiving dinner and it provides a healthy and tasty vegetable that will have the family coming back for more (even the children!). Whip this up for your Thanksgiving! Cut off the brown ends of the Brussels sprouts and pull off any yellow outer leaves. Mix them in a bowl with the olive oil, salt and pepper. Pour them on a sheet pan and roast for 35 to 40 minutes, until crisp on the outside and tender on the inside. Shake the pan from time to time to brown the sprouts evenly. Sprinkle with more kosher salt and serve immediately. From Pierce Insurance Group, we hope that you and the family have a great Thanksgiving Day! Be sure to contact us for all of your insurance needs in McKinney, Illinois.